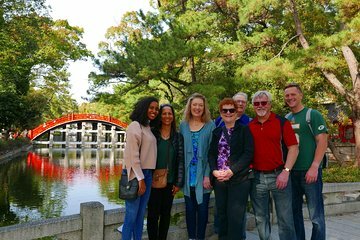 Visit Osaka’s ancient Shinto shrine, Sumiyoshi Taisha on this walking tour that touches on the heart of Japan. Your guide teaches you the history and shows you the power spots of this important place. Then visit the core of the Japanese food scene at Kuromon-Ichiba, and try Osakan street food like takoyaki (octopus dumplings) and other delicacies. Meet in front of the Tourist Information Namba: ground level of Takashimaya Department Store and Nankai Railway Namba Station at 1:50 pm on tour day. Tour will start at exactly 2pm. Tour guide will be holding the All Star Osaka yellow flag. Please allow enough time to locate the meeting place or check it beforehand especially if you are the first timer or not familiar with the area.